"This paradigm called battery life." Not sure that usage is correct. "Today we take the conflict away, and I am absolutely sure of that." We're getting a snazzy intro video, of course. 12-inch screen, portrait orientation. Start button on the right! Same kickstand, but it folds into multiple position, 9.1mm thick. Better-than-HD screen, still got the kickstand, thiner, plus stylus. A pen is included, pressure-sensitive. USB 3.0. Type-covers are there, in multiple-colors. It pops up, too, to give a better typing angle. Aesthetics are much the same as the current Surface. 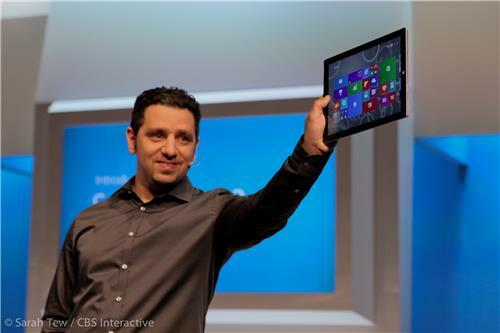 "This is the tablet that can replace your laptop" -- says Panos. Ok, so some design improvements to be sure, but is it really that different? 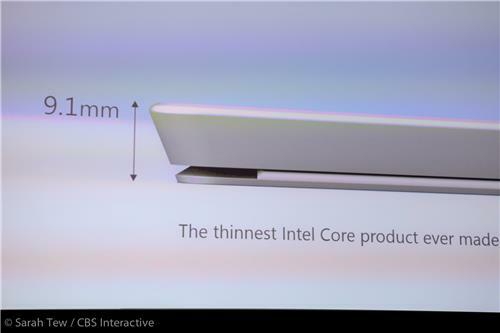 9.1mm thick is pretty good, however. Bezels are definitely narrower, the device is thinner. The most interesting thing is the orientation change. Again, the start button is on the short side now, relative to the current models, where it's on the long side. 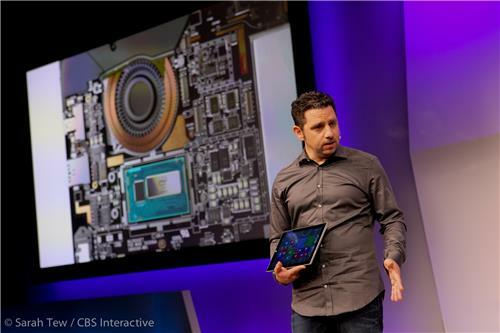 Again, 9.1mm thick, the thinnest Intel Core product ever, says Panos. It went down from 10.6mm to 9.1mm. 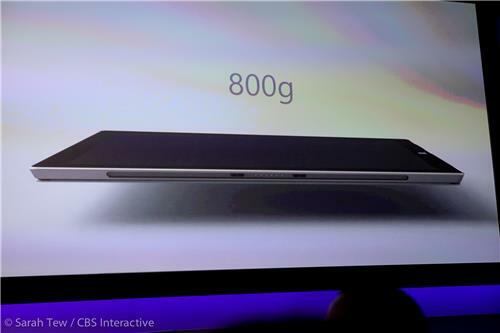 It's also faster than the Pro 2, despite that thinness. Snap-on magnetic keyboard looks mostly the same, but with a little kickstand-like bump to raise the back of the keyboard. 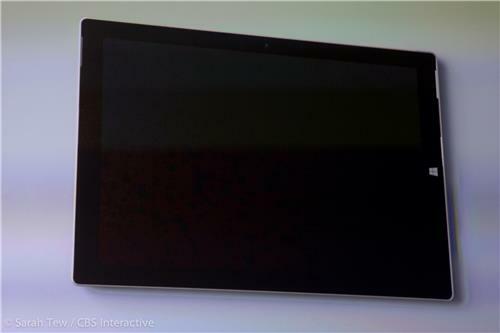 The display is "absolutely beautiful" -- 12-inches, a 3:2 aspect ratio. 2,160 x 1,440 - "Pixel Free" is Microsoft's term. Optically bonded, "the highest contrast ratios in the industry." 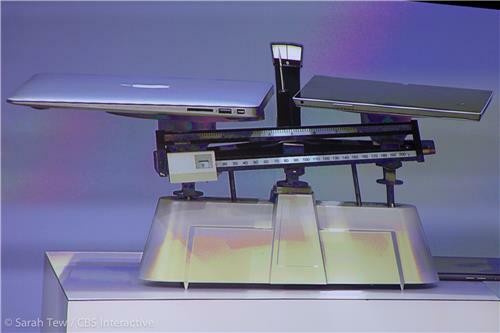 Ah, with a 12-inch screen, the MacBook Air we see (with a 13-inch screen) hiding behind the scale on stage makes more sense. 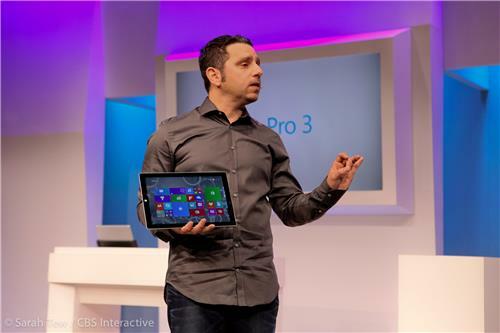 "This product is beautiful," Panos has said repeatedly. He's seemingly quite fond of the thing. 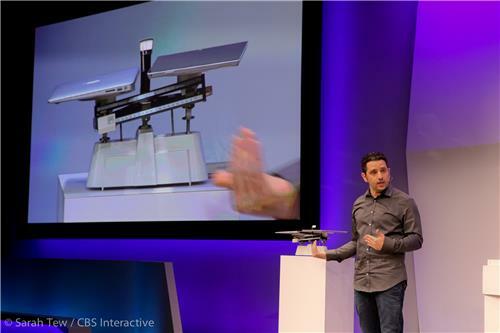 Weighs 800 grams. Quick, someone translate that to something I understand! "The best way to get a feel is to hold it, the second best way is to kind of show it." Here comes the scale. 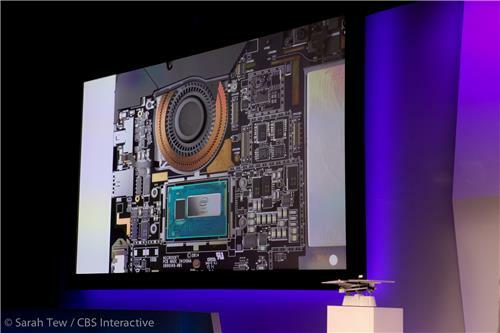 It's hugely lighter than a MacBook air -- no surprise, the MacBook has a keyboard. The Air has a larger display, too, but it is lower resolution of course. Panos says they have "optimized the scaling" perfectly, meaning you get 6% more content than on the 13-inch Air. 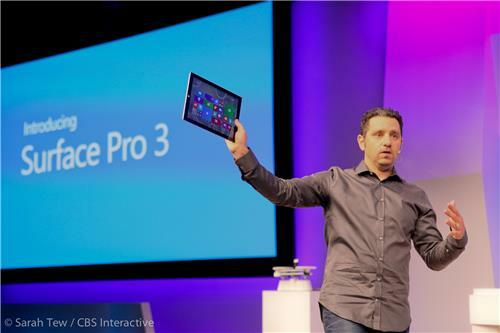 He's now throwing an iPad Air into the mix, too... because the Surface is supposed to do both. Though we still don't have a keyboard up there. They've partnered "super close" with Intel, saying it was a "technical love affair" to make it happen. 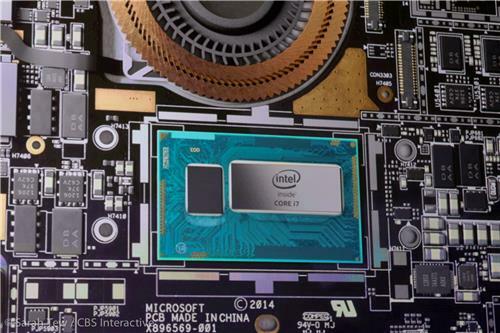 There's Core i7 in there, with a fan too. Ok, so keep in mind we're weighing a brand-new Surface 3 against a MacBook Air design that's basically three-plus years old -- of course, that's totally Apple's fault for not updating the MBA design. Panos is talking about the fan now. "We talk about fanless all the time. Fanless is an interesting concept... Another way to say fanless is thin. Another way to say fanless is cool to the touch. Another way to say fanless is you don't feel the air."